One of the cool things about StartUpLand is that it brings innovation to organizational design, not just old-line industries. Lean Startup methodology, customer discovery and agile development are among just a few managerial innovations that started in StartUpLand and swept through corporations large and small, young and old. Another one of those high impact, general organizational innovations is the rise of the Growth function. I have written about this phenomenon a fair amount, including this Harvard Business Review piece, Every Company Needs a Growth Manager. The founder of this movement is Sean Ellis, a brilliant marketer who has been a part of successful startups like LogMeIn and Dropbox and become so passionate about the growth movement that he started a company and community dedicated to it: GrowthHackers.com. 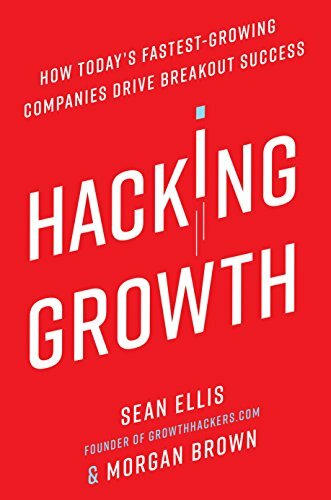 Now Sean has written a book, in conjunction with Morgan Brown, called Hacking Growth, which is being released tomorrow. Having had the opportunity to read it in advance, I can tell you it is a terrific book and belongs up there with Geoffrey Moore, Eric Ries and Steve Blank’s books as a fundamental part of the canon of StartUpLand (since, as everyone knows, entrepreneurship is like a religion). I have long admired Sean’s work and have had him as a guest in my HBS Entrepreneurship class, Launching Technology Ventures. I preach the use of his “40% test” to all my startups and students (i.e., would > 40% of your customers be very disappointed if your product were to disappear?). Thus, I had high expectations when I learned he was writing a book that would codify his decade of experience launching, building and advising growth teams. Reading the book, I was not disappointed. Sean and Morgan cover the key elements of what the growth function does, how to build it, operationalize it, measure it and ensure success. Chock full of case studies and practical examples, the book gives a practical guide for the practitioner. In addition to synthesizing his best blog posts (and others) on the topic, it covers new ground by providing more detailed, pragmatic frameworks (e.g., how to measure and prioritize growth ideas using the ICE method: assessing impact, confidence and ease). It also introduces a concept I love, “channel/product fit”, which provides six factors for ranking potential acquisition channels, assisting with prioritization (based on a technique used at Hubspot by another extraordinary growth leader, Brian Balfour). The step-by-step approach to hacking acquisition, hacking activation, hacking retention and hacking monetization will be invaluable for executives at companies of any size. Some critics have claimed that Growth Hacking is just a fancy name for Marketing. In response to this question, Sean joked with me once that he invented a new label because the marketing function was valued so lowly in StartUpLand as compared to product and sales functions. Whatever you call it, the insights and rigorous approach behind enlisting cross-functional teams to break down silos and use out-of-the-box, creative thinking to conduct rapid, real-time marketing tests is a major innovation that deserves study. Reading Hacking Growth is a good first step in that direction. It’s that time of year again! Graduating students hungry to dive into the startup community (aka StartupLand) are eager to start their careers but struggle to select the right, specific opportunity. Each spring, I provide a comprehensive list of exciting, growing, hiring startups–both private or recently public–that are worthy of consideration as places to start or continue a career in StartupLand. Before we get into the companies themselves, I suggest checking out my post Seeking a Job in Startup Land, where I give some advice on how to select the right company for you. Once you have reviewed this framework for deciding what you’re looking for, this post will give you a list of over 350 companies to research and approach. As usual, the list is compiled and organized based on location since I believe in selecting a geography to plug in to (and contribute to) a community and ecosystem. I received fantastic input from angels, entrepreneurs, lawyers and VCs across the world, helping me pressure test and compile this list (note: Flybridge portfolio companies are in blue). I’m sure I made many mistakes and omissions, which are all my own. Feedback welcome! That’s it! Edits/suggestions welcome. Special thanks to all those who provided me with input (who shall go nameless to protect the innocent) as well as my colleague, Nick Shanman. I am a 2x entrepreneur, Harvard Business School Lecturer, and general partner at Flybridge Capital Partners, an early-stage investment firm focused on technology companies. SEEING BOTH SIDES Blog at WordPress.com.